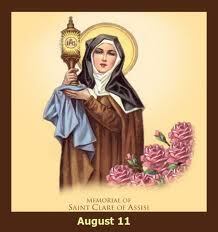 On August 11, 1253, St. Claire of Assisi went home to be with Christ. Claire, a personal friend of Francis shared with him his desire to live simply, powerfully for Christ. She renounced great wealth and position to become the first woman to enter into the early Franciscan order. She would continue to become the servant~leader of the Poor Claires. Claire, then and now, give us a powerful example and lesson of a human soul who understood it was not about position or rank, status or wealth. She did not fret that her Church did not allow her to be a priest or bishop. It was not about any of that..it was not about….Claire. With Francis she understood and realized the greatest of any vocation was to follow Christ in whatever life He has for us. She also realized that all the wealth, the status of the world was nothing more than waste that came between her and God. May the life, friendship, example of Claire helps us all to draw closer to our Lord.